To show that interaction with computers can happen via ‘the brain‘ [no keyboard, no mouse, no cables] you may first have a look at a development of a game I am in a way ‘involved’. First I am a Kickstarter of the project ‘Son of Nor’ by ‘Still Alive Studios’. I recomend that you first watch die Youtube video and then you continue to read. Is´nt it Awesome as Julian says? The website of emotiv.com explains how the EPOC headset works and how the person using it can test and train. And it looks cool for sure. There is a product made in Austria I tried some years ago with success. I could actually ‘see‘ the computer typing what I was thinking, letter by letter, digit by digit [recognition rate was about 80%]. Please click on the picture ‘g.Scarabeo’ and you see a video. The product made by g.tec is used in medicine for handicapped persons and is designed for a use by wire – not so cool for artists ‘in motion’. Sorry to say this, but the company did not listen to me to make an ‘artist version’ [at least not until now]. Let´s go on with the ‘cool stuff’. Art creation within the center of ‘The Volcano’. I am a bit unlucky that Bologna, Italy [where the ROBOT Festival happens in October 2013] is not located next to ‘The Vesuvio’ (Mount Vesuvius). But some 100 miles more or less: Has this any meaning in art? 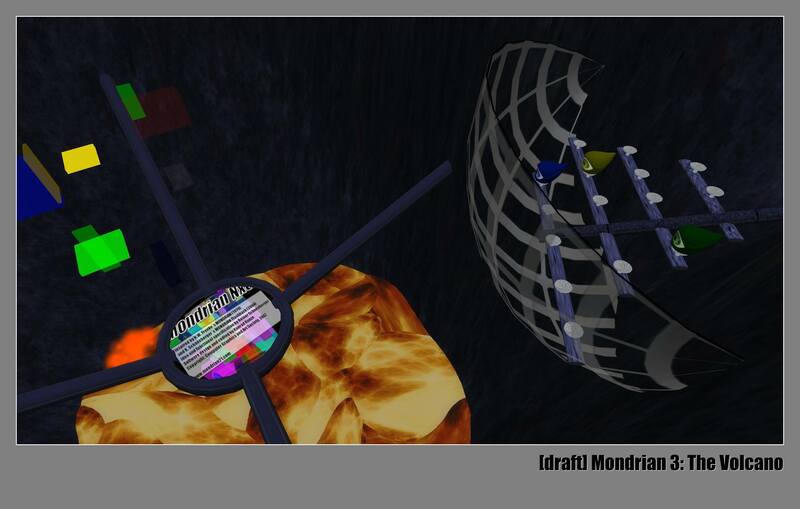 Now lets see some ‘DRAFT’ screenshots of ‘The Art Volcano’. But I have even better: I share with you the first experiment ‘of a thought in the Volcano’ – just 30 seconds of ‘brainwaves’. First User came to: MAKE BELIEVE. Just click on the artwork, made by Art Blue, ‘make it‘. Dissapointed? Just a few cubes came out of the Volcano? Yes this is it indeed! Technology is working. One cube by brain or 100? Where is the point? Imagine there are a few ‘brains’. There are many. Now artists are about to take ‘it over’. Until today [27. June 2013] there are artworks of 25 artists to feed the Volcano. I will make some Photo-Albums in facebook where you can see the collection growing. 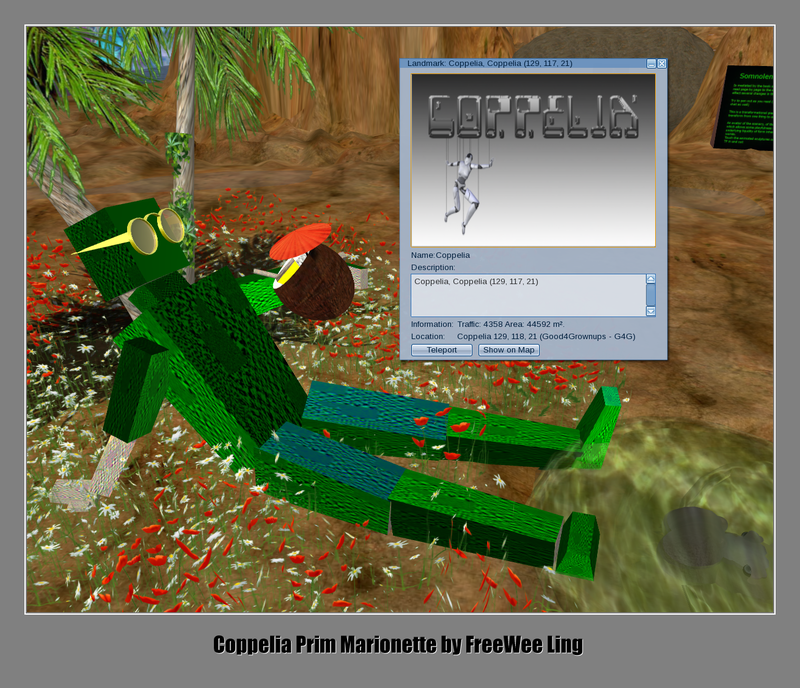 But you can also just relax as this ‘green’ robot ‘Prim Marionette’ does. You can get him for FREE at SIM Coppelia [in SL], made by FreeWee Ling, curator at UWA University of Western Australia. Coppelia is the home of many artists, like Jo Ellsmere. All the works are presented around the Volcano and carried by robots to the top … ready to be transformed in Bologna to MONDRIAN3 cubes by ‘the brain’. Become ‘AN EYE’ to visit the simulator world-wide. 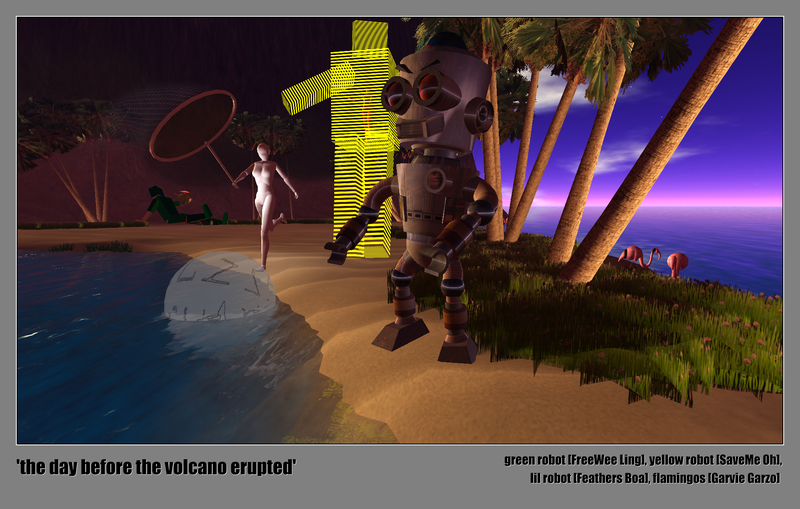 The 3D-viewer is available for download and for interested artista a pre-visit as ‘an EYE-Avatar‘ is possible.